Myisha of Springcart sent in prints of super chic ladies that she drew! And as usual, if you want to know when the giveaway will be for October’s round, remember to sign up for our mailing list! If you can’t wait for that, you can always pick up a package from our August participants to tide you over! Okay, now I need to haul myself back over to the new studio to do the umpteenth round of cleaning up (I am painfully aware that I sound like a broken record!) 🙂 But before that, I want to point you over to one of my favorite blogs — the wonderful and inspiring Grain Edit — for a chance at winning an assortment of goodies from illustrators + artists that Dave has featured before, including the newly-married Julia Rothman and superb Matte Stephens! Have a nice weekend y’all, and thank you for the lovely wishes! I was away for a few days cleaning up and preparing my new home for moving in. 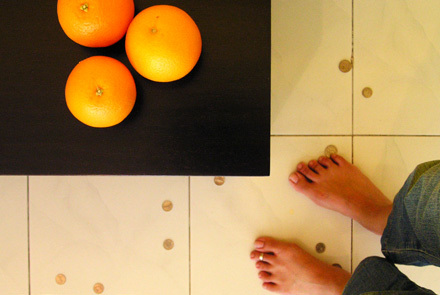 This photo shows coins on the floor, which we threw into the house to symbolise good luck; a couple of oranges were rolled on the floor too! The Shiny Squirrel is ONE! The Shiny Squirrel — a place to shop for exclusive limited editions and one-of-a-kind artworks — is turning one, and to celebrate, Jessica is offering a special surprise when you mention Pikaland during your purchase of USD20 or more from her shop! Happy birthday to the shiniest squirrel there is! EDIT: You can have a look at Emmi’s blog over here Jormalainen, via the awesome Gemma Correll.